Marine boat owners invest a great deal of time and money in their watercrafts, and they expect the fuels they put in them to perform optimally every time with a minimum of problems. Yet experienced boat owners know certain kinds of fuel-related problems do exist and come with the territory - they may even be viewed as inevitable. Some users simply put up with these issues while other watercraft owners fight back through the use of fuel treatments like Bell Performance MARINE MXO and MARINE DEE-ZOL. Check out the video on ethanol problems in boats below. Marine fuels, whether ethanol-blended gasoline or marine diesel fuel, have the same kind of issues that non-marine, on-road fuels have. Yet the unique nature of the marine environment means some of these problems are amplified. For example, the humid marine environment is a perfect setting for water to condense in vented fuel tanks, where it collects and sinks to the bottom of the tank. In diesel fuel, this water buildup promotes oxidation and fuel breakdown. And since diesel fuels tend to be stored longer (if your marina stores diesel fuel for use by multiple boats), bacterial and fungal growth is always a possibility when water is present. Once bacteria and other microbes establish a foothold, they are impossible to get rid of without a biocide, and lead to further diesel problems including quality breakdown, corrosion of tanks, deposit buildup and nasty filter plugging problems. Ethanol-gasoline fuels don't spend as much time being stored as diesel fuels do, but they have their own serious problems with water buildup. This is because ethanol chemically attracts water out of the surrounding air - this is a bad enough problem for cars and trucks, but the marine air makes it even worse. Water buildup in ethanol fuels promotes phase seperation, where the water will pull the ethanol out of the blend and mix with it on the bottom of the tank, leaving a poor combusting, low-octane gasoline layer up top. If this gets sucked up into your diesel engine, it can, at the least, result in lean fuel mixtures, rough running and poor performance by the boat, and at worst, serious engine damage through burnt valves can result. Ethanol blends also do a serious number on rubber and plastic fuel system parts and tanks. The ethanol in the blend has a corrosive effect, eating away and dissolving these parts over time. 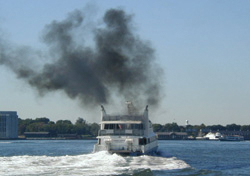 A leaky fuel tank or gas line due to ethanol solvency is a serious fire hazard and can emit black exhaust smoke from a boat diesel engine, leaving you stranded on the water. What's more, the dissolved plastics, rubber parts and resins can lead to serious deposit buildup and filter-plugging. Speaking of deposits, many boats do a lot of idling and this means a greater chance of deposits building up in engines using either diesel or ethanol. Whether injector or valve or combustion chamber deposits, they all have ill-effects on boat fuel mileage, performance and the black exhaust smoke so commonly seen especially in diesel marine engines. Bell Performance, inventors of the first fuel additive on record, has been manufacturing premium fuel treatments for the marine market for decades. Bell MARINE MXO (for ethanol) and MARINE DEE-ZOL (for diesel) address these and other marine fuel-related issues, solving fuel-related problems and saving consumers time and money.